Researchers Revealed explores new technologies that researchers are using to study the natural world. Following scientists from the Biodiversity Research Centre at the University of British Columbia, we travel from oceans to deserts and far-off jungles, uncovering the answers to some of our most pressing questions about life on Earth. 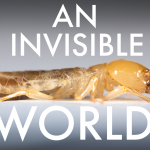 In An Invisible World, producer Philippe Roberge and microbiologist Filip Husnik take us inside the hidden world of termites, and the alliances they form in order to break down wood. When people think of termites, they might picture ant-like insects building huge mud towers on the savannah. But it could surprise you to learn that they can be found much further north. Even as far north as the forests of British Columbia! Termites have a lot of work to do, eating away at wood – which is actually really difficult to digest. 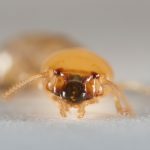 In order to break it down, termite species form symbiotic interactions with hundreds of microbes. These interactions are mutually beneficial partnerships between different organisms, like gut bacteria that help us humans to digest our food. In termites, there are bacteria, archaea and protists – all different types of microbes – that help the termite to break down wood. 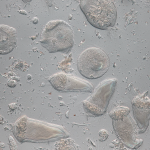 Protists are particularly important because they are ‘eukaryotes’. 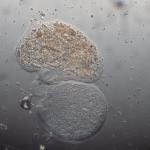 Their cells are exactly the same type as animal and plant cells – complex cells with a nucleus. Bacteria and archaea are ‘prokaryotes’ – much simpler cells with no nucleus. In my research, I usually start with a termite. 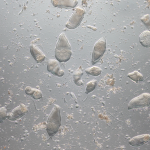 I dissect its gut, and using a glass needle I pick up individual cells from these tiny protists using a microscope. I wash them a couple of times, transfer them to individual tubes and use them for whole-genome amplification – a process which provides me with more DNA to study. So from single cells, I’ll get a huge amount of DNA which I can then sequence using different technologies such as Illumina or MinION sequencing. From there, I can assemble all these DNA fragments together to understand what organisms were present in this single individual protist cell. This is important, because it allows me to separate which bacteria and archaea are actually interacting with this protist cell, and which are just flowing through the termite gut. Looking at these symbiotic interactions is an essential part of understanding how termites can digest wood. Without termites and other decomposers, trees that fell would simply stay there, causing obstructions and the accumulation of carbon that wouldn’t be cycled back into ecosystems. 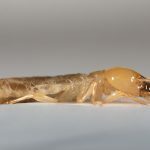 The ecological role termites play is so significant we shouldn’t really think of them as pests damaging your home, but rather as an important world of their own, housing thousands of species! Eucomonympha and Barbulonympha, 2 protists found in the gut of wood roaches. Protists found in the gut of wood roaches. 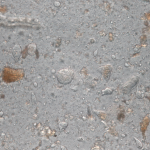 Protists found in the gut of pacific dampwood termites.